By all accounts, President Trump’s gut instincts are far superior to the “knowledge” of his advisors when it comes to the Islamic threat. In the end, his generals convinced him to turn his focus away from the domestic Islamic threat and re-engage in combat operations in Afghanistan. And where is the designation of the U.S. Muslim Brotherhood as a Foreign Terrorist Organization? This is incoherent and factually wrong. This lack of understanding among senior advisors to the President is exactly why the United States continues to have little impact on the Global Islamic Movement, even while the U.S. military is killing Islamic State fighters overseas. You cannot defeat an enemy you refuse to identify and define. There is one Islam and one sharia. The fact that sharia is implemented in different stages and to differing degrees in different nations does not constitute “many versions” of Islam. Muslims are obliged to impose sharia to the greatest degree possible in each area around the globe, and that is exactly what the Global Islamic Movement is doing. See the video of Dr. Gorka’s comments on CSPAN with UTT’s President John Guandolo providing rebuttal here. 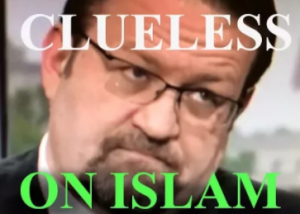 See the UTT video from February 2017 calling National Security Advisor Herbert McMaster and Sebastian Gorka “Unfit for Duty” because of their ignorance of Islam and sharia HERE. As UTT continues to make clear, any individual or organization which perpetuates the lie there are competing “versions” of Islam, is providing our enemy room to maneuver in the Information Battlespace and, therefore, their efforts are destructive and hostile to the United States regardless of the intent. In this war, bold truth about the Islamic threat spoken clearly with well-defined language is the best weapon against a sea of propaganda, disinformation, and deception. President Trump understands at a gut level Islam is the problem. He should stick with that and lead accordingly. Brilliantly explained John! Everybody must understand this to truly understand the threat. How to get this information to President Trump is the issue, the instinct that candidate Trump had was the largest reason he was elected…in my opinion, because the Trump supporters were voters who had found information on Islam that was accurate. The media was so wrong on the Trump election due to this information that was available on the internet, and the excellent websites such as UTT, Unconstrained Analytics, Jihad Watch, Center for Security Policy and David Horowitz Discover the Networks, Counterjihad Report, books, and thorough information that would come from the factual authentic sources such as reading the Quran. The people who found this information took the challenge to inform themselves.Far from “deplorables” or any other description that regular people could not be so smart to “understand” or be influenced by the Obama intelligentsia crowd who only thought that Islam was peaceful, nothing to see here and stay silent. Deception is a clever intrinsic in Islamic doctrine and the marketing was perfected…but many saw through this and kept informed to say this sharia law is dangerous just like not knowing the doublespeak is also dangerous and it is very well funded to this day. I agree completely. Islam may be of “7”, (I would say even more) variations, (code word for “stages”), but “There is one Islam and one sharia”. I have been to Muslim Country’s for decades, (even done business with them), and have studied Islam well. It did not take me long to use their own “traps” against them; just to make a small profit. We were one of the largest contractors of used commercial web offset & sheet-fed printing equipment in the Middle East. In time, after deep study and research of and about Islam & the Qur’an, I learned from records of antiquity that Islam was created by the Roman Catholic Church, not too long after they created “Christianity”, (to make the Pagans happy), as we know it today; BOTH for political reasons. The true birth of a one world Government. All of this and more sits in the library’s in the Vatican. They even politically jumped into supporting corrupt Rabbi’s that polluted Judah. Would it shock you that the Catholic Crusaders were NOT sent out against Muslims?, (Though they did for some Muslims that did not want to “agree” with following). The Catholic Crusaders went after ANYONE who rejected Catholicism, (their “Christianity”), for the most part against Yahshua’s (Falsely translated as “Jesus”) Congregation. Would it shock you that the Catholic Crusaders recruited Muslims to carry out the most brutal part of their mission because they could not even stomach it? If you want, I have a book, a detailed book, with comprehensive reference links that will blow your mind; PDF in full for free if you ask. This is utter nonsense. This narrative contradicts historical facts. The Catholic Church did not “create” Christianity, Jesus established his Church. Islam came out of claims from Mohammad who told others he received revelations from Allah – Islam’s god. There is no factual basis for any of these claims. Dear Understanding the Threat: Thank you for voicing the truth about what we’re facing in this, the most powerful subversive influence operation we’ve ever faced. Never before have the people of the USA known so little about their enemy. Educate yourself because your children’s future relies on what we do now. -Eurabia by Bat Ye’or 2005 (Ye’or gives the BIG PICTURE, focusing on Europe. -John Guandolo’s Understanding the Threat-this video is the most evidence-packed, succinct document you will see on what we’re up against.